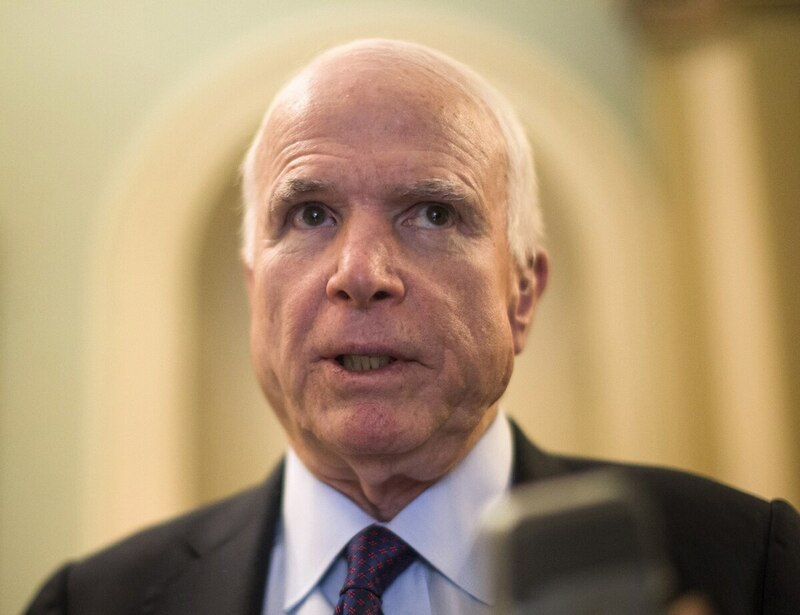 WASHINGTON — Senate Armed Services Committee Chairman John McCain said Tuesday that U.S. President Donald Trump has to watch his words better after the commander in chief threatened North Korea in an escalating nuclear standoff. “It’s a difficult challenge, and I hope the president, which he is not now [doing], would be very careful about the language he uses,” McCain, R-Ariz., said in a Facebook town hall broadcast from his office in Phoenix. “I’m not exactly sure the president recognizes that when he speaks, [as] the most powerful person in the world, his or her words reverberate all over the world,” McCain said. McCain also cautioned Trump to consult with his advisers before shooting from the hip on Twitter. In a previous interview, McCain told KTAR News that Trump would be better off emulating President Teddy Roosevelt’s “walk softly” and “big stick” ethos. “The great leaders I’ve seen don’t threaten unless they’re ready to act, and I’m not sure President Trump is ready to act,” he said. Trump on Tuesday told reporters North Korea “had best not make any more threats to the United States or they will be met with fire and fury like the world has never seen.” It was apparently a response to reports Pyongyang has produced a miniaturized nuclear warhead. On Wednesday, North Korea announced it was reviewing plans for a preemptive strike on Guam, including Andersen Air Force Base, and it ripped the U.S. for provocative military flights in the region. That in turn prompted Defense Secretary Jim Mattis to warn North Korean leader Kim Jong Un to “take heed” and stop the nuclear threats that could lead to the destruction of his people. McCain was among the chorus of lawmakers, mostly Democratic, who criticized Trump’s saber rattling as unhelpful in the face of diplomatic efforts to deescalate. “When it comes to North Korea, the United States has many tools — diplomatic, financial and others — to work with, not just military options,” he said. McCain hinted at the potential carnage if the U.S. went to war with North Korea. Pyongyang, he said, can launch strikes on South Korea from thousands of protected artillery positions over their shared border. He urged a multipronged effort to not only press China to use its influence to have Pyongyang back down but to deploy the American-made Terminal High Altitude Area Defense, or THAAD, system in South Korea. The South Korean government called for increased deployment of THAAD launchers in July following North Korean missile tests, but the system is politically divisive there and an irritant to China. McCain urged Trump to listen to his team, lauding Mattis, White House Chief of Staff John Kelly and national security adviser H.R. McMaster by name. He did not mention White House adviser Steve Bannon save to reference reports Bannon is clashing with McMaster over the administration’s foreign policy direction. Otherwise, McCain advised calling in Cold War-era diplomats like Henry Kissinger and George Schultz for advice. McCain could not resist knocking his old foil on national security issues, President Barack Obama, who left Trump with “eight years of failures” to clean up, he said.